Castor oil is one of the rich and multi-purpose oil that people are using form thousands of years. Castor oil happens to be one of the widely used oil because of its numerous benefits. This oil is made by extracting the oil from the seeds of the Ricinus communis plant. It has a number of medicinal, pharmaceutical and industrial benefits. The benefits of this oil just not limited only to its anti-inflammatory properties but it has many more benefits for the skin, hair, and health. Check out this article to know such benefits of castor oil for skin, hair, and health. Take a few drops of castor oil and apply it on your clean face. Massage it gently for 5 minutes and then sleep. Do this every night and wash your face in the morning. If you have oily skin then apply this only to the area where you see the aging signs. Castor, when applied to the skin, goes deep in the skin and stimulates the production of collagen and elastin which slow down the signs of aging. Wash your face with warm water first. It will help you to open the pores. Now take the oil and apply it on your face. Massage it gently for 5 minutes and leave it for overnight. Wash this oil in the morning. Use this remedy every day. Castor oil is rich ricinoleic acids which fight against acne cause bacteria and make face acne free. Take some amount of your favorite moisturizer and few drops of castor oil in it. Leave it overnight and wash your face in the morning with a mild face cleanser. This is suitable for excessively dry skin and if you have normal to combination skin then just apply castor oil for moisturizing the skin. The highly concentrated fatty acids penetrate the skin well. It removes the dry skin and moisturizes it well. Mix a few drops of castor oil with sandalwood essential oil. Apply this solution on your clean face. Massage it for 2-3 minutes and leave it overnight. Do this daily and have the patience to see the results. Fatty acids present in the castor oil helps to fade the blemishes and make skin brighter. Mix both the oils in the prescribed quantity. Apply this to the areas where you have the marks. Apply this oils 2-3 times a day for better and faster results. Do this daily until you see the marks vanished. Stretch marks are the cause of dry skin which lost its elasticity. Castor oil moisturize the dry skin and reduce stretch marks. Add a few drops of castor in a bowl. Now add a few drops of lemon juice in it. Massage this oil for 2-3 minutes and then leave it for 20 minutes. 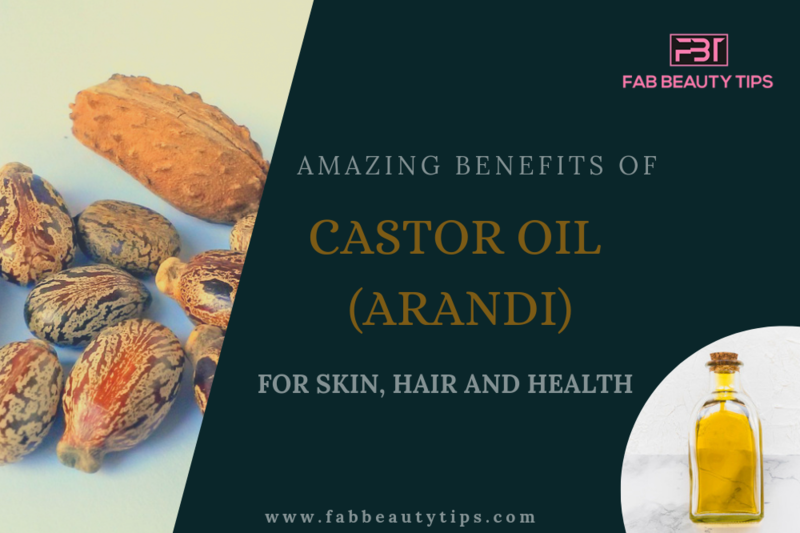 Castor oil helps in reduces the pigmentation by moisturizing the skin and also make it lighter. Take the generous amount of the oil and start massaging your face gently. Massage each and every part of the face and neck for 5 to 10 minutes. Now take a clean washcloth and dip it in the hot water, place it on your face. Make sure it is not too hot that it burns your skin. Keep it until it feels cools. Do this 2-3 times and then rinse your face with cool water. It is recommended to use castor in place of the harsh chemical loaded face cleansers. It cleanses skin deeply without any harm. Dip the cotton ball in castor oil and apply it on the wounds or inflamed skin. Its antibacterial and antifungal properties make it perfect oil for healing the wounds from internal as well as external. Wash your foot first with lukewarm water and pat dry them. Take a generous amount of castor oil and apply it on your foot. Now for locking the moisture in wear socks and sleep. Do this daily for soft and beautiful feet. It is rich in vitamins and nutrients that help in hydrating the dry and cracked heels. Dip a Q- tip in castor oil and apply to the lashes carefully. Don’t rub your lashes with the Q- tip just be gentle on the eyes. Do this daily at night before going to sleep. When applied on a regular basis this oil helps in lengthening the eyelashes. It contains vitamin E, minerals, proteins, and antibacterial properties. Take few drops of castor oil and apply it on your cuticles and nails. Massage it for a few minutes and wear cotton gulfs for locking the moisture in. Castor oil has a high concentration of vitamin E which helps to heal the brittle and dry nails along with softening the cuticles. Mix castor oil and coconut oil in a bowl. Heat them up with the help of double boiler process. Now apply this oil on your scalp and hair and massage for 5 minutes. Leave it for 2 hours or overnight. Use this remedy at least twice a week. Castor oil helps the hair to grow long and healthy because it has high levels of vitamin E.
Mix castor oil, coconut oil and tea tree oil in a bowl. Apply this oil to your scalp and hair. Massage it for 5 minutes and leave it for at least 2 hours or overnight. Use this oil twice a week. Castor oil is antibacterial and antifungal in nature which fights with the infections causing symptoms. Mix all the ingredients and apply to your roots. Cover your hair with a shower cap and leave it for 2 hours. Wash your hair with a mild shampoo and do condition your hair after that. Castor oil helps the hair to retain its pigment and it is the best way to prevent the premature greying problem. Add 1 tsp of castor oil in your leave-in conditioner and shake the bottle well. Use this after you are done with the shampoo procedure. Use this as when you wash your hair. The humectant properties of the oil help the moisture to lock in the hair which conditions the dry and damaged hair. Take the piece of fabric and fold it in a square shape. Now dip the fabric in oil and remove the excess of it. Place the cloth on the affected joint. Cover the fabric with a plastic wrap and place a hot water bottle on it. Do this whenever you feel the pain in joint. The anti-inflammatory properties found in castor oil make it best for relieving the joint pain, nerves and sore muscles. Use castor oil in your daily diet. Add some of it as a seasoning on salad and use it in fast foods also. Castor when used topically increase the number of favorable cells which in result boost immunity. Massage the castor oil on the back for a good 5 minutes. Place a heating pad or hot water bottle where you feel the pain and leave it for some time. Use this whenever you are feeling the pain. Massaging castor oil on the back is the best way to combat a backache. It is a natural pain reliever so it helps with a backache. Apply warm castor oil on the abdomen. Massage it for 2 minutes and use any heating method to give heat to that area. Do this from the starting of the menstrual cycle. The presence of ricinoleic acid in castor oil make it the best way to treat the pain of menstrual cramps and period pain. Massage some castor oil on the forehead for a good 5 minutes. Cover your forehead and eyes with fabric and sleep for 30 minutes. This will help with a migraine and its symptoms. Castor oil is great for relieving the pain of headaches and migraines because of its natural pain reliever properties. These are some amazing benefits of castor oil from our list Now when you know the benefits of this amazing castor oil then add it to your daily regime. Do leave your comment below and let me know how this article helped you and do share it with your friends too. This is such a detailed and wonderful post. Every thing we need to know about castor oil in one place. Thank you for sharing. I love reading such detailed blogs and ideas for a better skin care and hair care. Thanks a lot for sharing this. I will try few of them pretty soon. All what I knew about Castor oil was that it is great for hair. I never knew that it can be so important for skin and even ageing. Thanks for sharing. I was aware that castor oil is great for hair but it is good for skin too .. This is a well detailed wonderful post.. Thanks for sharing dear. Castor oil is really good for skin! I love it! I use it for hair and stretch marks… Didn’t know it has so many other uses! Thanks for sharing! Thanks a lot for telling us how to use castor oil for hair and skin. It has immense benefits and this info will surely help me. Wow! I didn’t know Castor Oil has so many benefits especially for skin. I am surely going to include it more now on in my daily routine. Thanks for sharing. Castor oil is one of the most potent oil around. I love to use it for my eye lashes, hair and nails. It gives tremendous results within a short span of time. Tried and tested. Castor oil is surely beneficial. I have been using this for my uneven skin tone patches on body and it shows results.